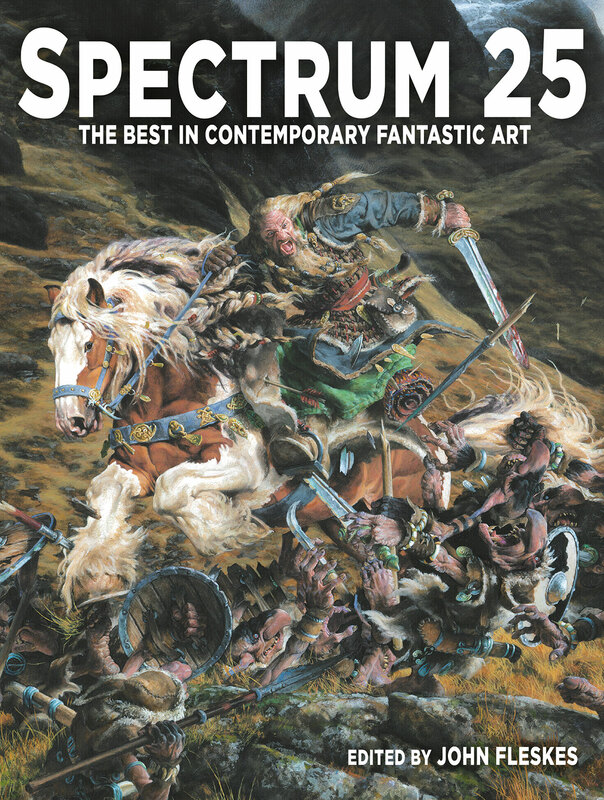 Spectrum 25: The Best in Contemporary Fantastic Art is Here! We received our copies of Spectrum 25 a few weeks back. We packed the complimentary artists copies and shipped them right away. We also mailed the pre-orders at the same time. The arrival of this book culminates a year-long process from the initial Spectrum Call for Entries that begins each year in mid-October. The deadline for artists or their representatives to submit their art falls toward the end of January each year. For Spectrum 26 this will be on Thursday, January 24, 2009. In no particular order, here’s some behind the scenes details about how the Spectrum process works. We typically receive a flood of entries, phone calls, and online and email inquiries during the final week prior to the deadline. Because of this, we are usually working full time confirming all of the entries for everyone for up to a week after the deadline. Kathy and I developed a process that lets us double check every entry to make sure that their information, payment, and artwork all aligns. I’m also checking to make sure that the art is clear and appears large on the computer screen. If I feel that the resolution of the digital file is too low, then we’ll reach out to the artist to get an improved file. I want everyone to have the best chance to be seen by the jury. I made one change for Spectrum 26. This was to eliminate the option of sending in hard copy prints through the mail for the judges to review. We introduced the option to submit online for Spectrum 21. I felt it was important to provide a 5-year transition period to allow those who may have preferred to send in their works as prints to familiarize themselves with the online process. By Spectrum 25 we had such a small amount of print entries that I felt it was time to phase out that option. 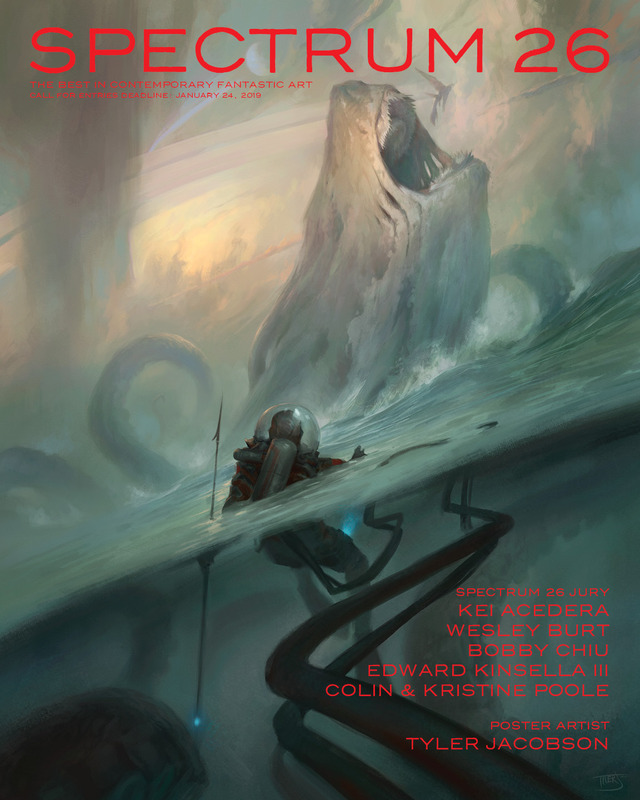 I wrote a history of Spectrum that you can read in Spectrum 25. Originally, I wrote a more typical Year in Review essay. I ended up abandoning the initial direction that I took after realizing that I would enjoy documenting the humble origins of Spectrum instead, especially considering that this was its 25th anniversary. The Call for Entries poster for Spectrum 25 utilized the talents of Spectrum Grand Master Scott Gustafson. Scott is one of only two artists who have been featured in every volume of Spectrum. (The other is Brom.) For the 25th anniversary I wanted to celebrate this occasion by highlighting Scott’s art. I don’t always consult with Arnie and Cathy Fenner when making decisions regarding the jury and call for entries poster artists, but for this occasion I wanted to make sure that I got their recommendations. They agreed that an artist who painted traditionally and who has been popular during the full tenure of Spectrum’s history would be an excellent choice. I oftentimes make the jury selection over the course of a few days during June of each year. This timing directly corresponds with when I turn Spectrum into the printer on July 1st of each year. In that way I can include the names on the last page of the book where I promote the next volume. The first thing that I do to determine the candidates is to page through the most recent volume of Spectrum. Since I don’t want the jury to be limited to those who submitted to or have been in Spectrum before, I’ll pour through Facebook and Instagram postings by various artists and see who else grabs my attention. I typically spend 15 minutes a day on these two social media platforms to stay in tune with the general tone and direction of the art world. I want Spectrum to capture the most current picture of the industry, so it’s important that I invite those who I feel will embrace the most current and relevant art forms for the book. Spectrum must always be looking forward and embracing change, while also being respectful to those who came before. I want everyone to feel welcome from a new art student to a legend who has been in the business for 40 years. I aim to find a jury who welcomes all sensibilities and forms no judgments or biases. Spectrum is a big job. The first half of the year is primarily focused on Spectrum, while the second half of the year leans more toward my Flesk book-making duties. I work on both year-round, but during these seasons I can get pulled more in one direction more than the other. When I work on Spectrum my focus is on the community as a whole. When I work on Flesk books my focus is on the individual artists who I am working with. It’s a good balance. The contrast between the two working methods keeps things fresh for me. I don’t really care much schedules or making plans too far in advance. I feel that I lose my creativity and whatever I’m working on at the time loses its spontaneity and looks too rigid if being organized takes precedence. While this method works for me, it’s very hard to teach, and if I’m working with someone who likes to write things down and cross off steps on a list we usually don’t function too well together. I see it as freedom, for others it may drive them insane and possibly make them anxious worrying about how things will get done. I am always confidant that what we need to get done will be wrapped up by the time it needs to be. After the Call for Entries deadline passes and we have finished confirming all the entries we begin to prepare the Flesk office for the judging event. We cover the traveling costs of the judges and put them up for the weekend in Santa Cruz, California. We start with a dinner on the Santa Cruz Wharf that overlooks the ocean the night before the judging event. This gives the jury a chance to relax after their day of travel and allows them with the opportunity to get to know one another better. The day of judging is a long day. The jury looks over all the entries anonymously. They do not know how the others vote. A majority vote, three or more picks, guarantees inclusion into the book. Then afterward, the jury gathers as a team and decides upon the silver and gold nominations and recipients for each of the eight categories. The Spectrum 26 Call for Entries poster was done by Tyler Jacobson. I saw one of his pieces in a previous Spectrum that I loved. It has a lot of energy to it with a high fantasy feel. I inquired with Tyler if he was willing to make the new poster and only pointed out the piece that I liked as an example of the tone that I was looking for. I don’t like to art direct the artists for the poster, and usually do not see a preliminary of finished piece until it is turned in. I select people who are professionals and trust them to do the job. The poster was designed by our very own Kathy Chu. Like with Tyler, I only gave her very minimal feedback regarding the tone, then trusted her to select a font and to do whatever she wanted. When I trust someone, I don’t look over their shoulder. I also like the idea that not everything is designed by me, nor is limited by my thinking. I like to stay fresh and that can only be done by welcoming the creativity of others into the mix. As Spectrum 25 reaches the hands of fans and people throughout the industry I get to look at the Spectrum 26 entries as they arrive. We have a fabulous group who will be joining us for the judging event. They include Kei Acedera, Wesley Burt, Bobby Chiu, Edward Kinsella III, and Colin and Kristine Poole. 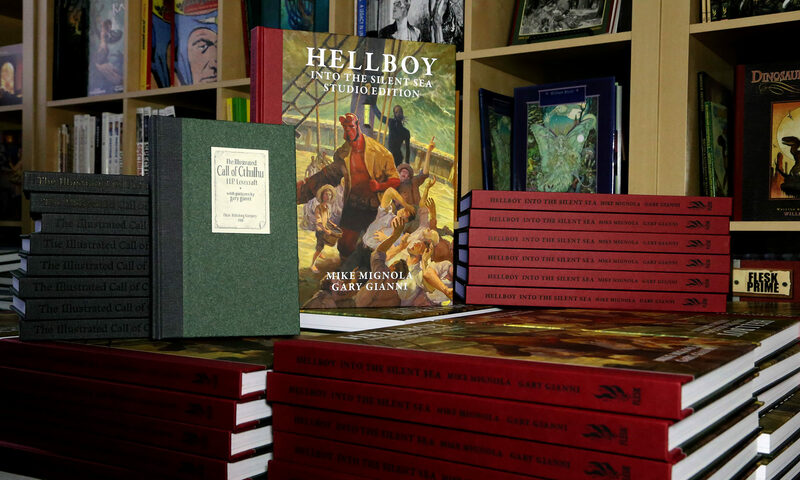 The Spectrum 26 Awards ceremony, which will be held on Saturday evening, March 30. The gala will be held at the historic Folly Theatre in Kansas City, Missouri, adjacent to the Kansas City Convention Center and will be open to all Planet Comicon and SFAL exhibitors, creators, guests and attendees. I hope you can join us! Thanks for reading. Thank you to everyone who has supported Spectrum! Next PostNext Flesk Book Sale!